Linda Peterson's collection of oyster plates, photographed by Kathryn McCrary for Garden & Gun Magazine. 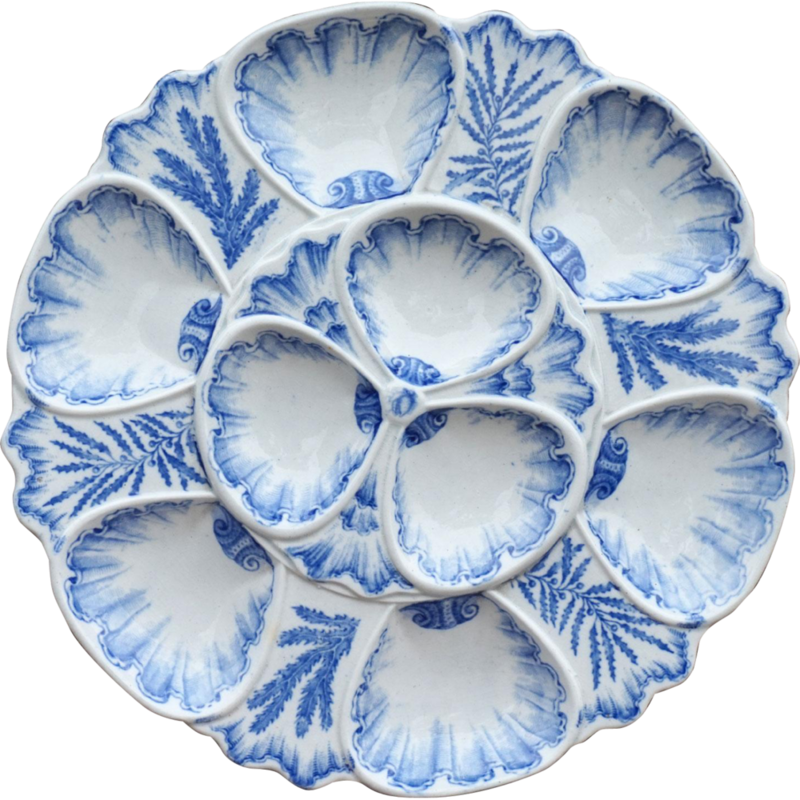 Oyster plates are one of those niche items that are so unique and esoteric, their status as a collectors' item comes as no surprise. Each one packs a big punch of quirky personality and rich design history, making them a treasure for the tabletop. Clockwise from top left: Limoges plate manufactured by Tressemann & Vogt, circa 1892-1907., from Ruby Lane. Majolica Vallauris pottery plate, signed Marcel Guillot. Celadon majolica plate from French manufacturer Gien. Parisian flea market find, circa 1900, from Gentlemanly Pursuits on Etsy. Essentially, they are all porcelaindifferent styles are named after various regions of origin and do have their distinctions, but the lines are blurry due to frequent overlap. The two main porcelain regions that produced oyster plates at the height of the trend in the the Victorian era (1837-1901) were Majolica and Limoges. Majolica porcelain is named after the island of Majorca, a major port off the coast of Spain. 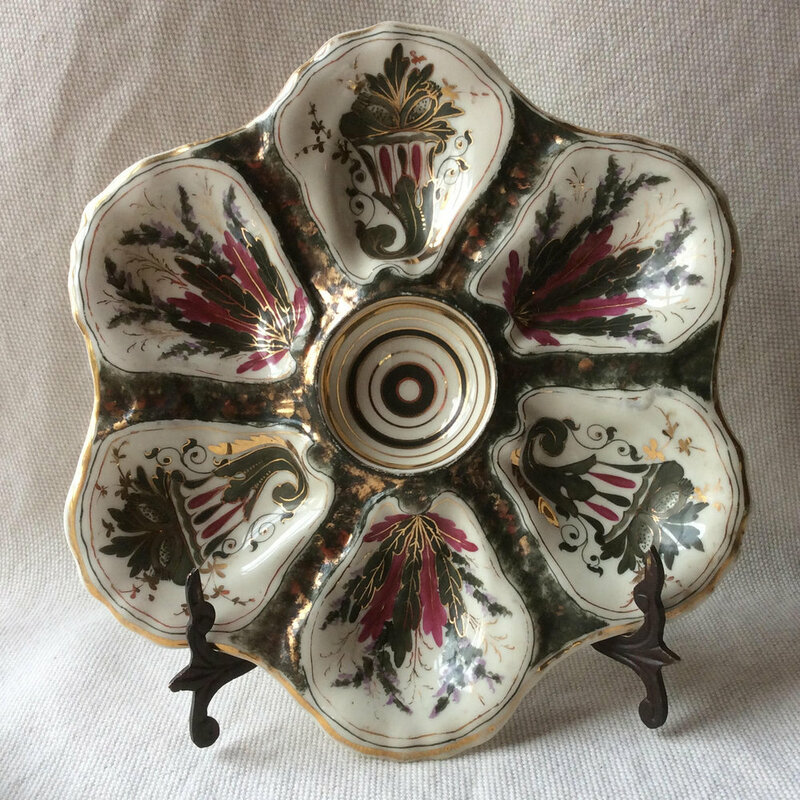 In the Middle Ages, there was a huge influx of Hispano-Moresque influence coming through Majorca into Italy, including ceramic wares that were glazed with tin-oxide enamels, fired at low temperatures, and decoratively painted. These tend to be characterized by a heavier hand, and are so frequently glazed with a celadon color that the color has also become a prominent signifier of the style. 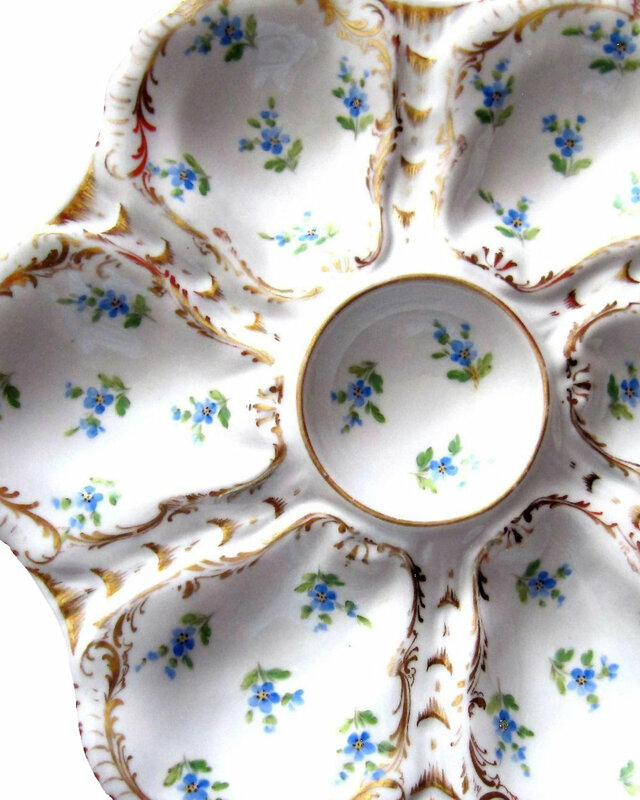 In the 17th century, majolica was further developed in England, with major manufacturers Wedgwood and Minton ushering it into the Victorian age—the height of the oyster plate trend. The style was also adopted by several major French pottery producers, such as Serreguemines. Paris flea market find circa 1800s, from Gentlemanly Pursuits on Etsy. 1930s vintage majolica produced by Serreguemines (France). Source: Shabby French Vintage on Etsy. Photo by Stephen Devries for Coastal Living Magazine. Limoges is a city in France now best known for their hard-paste porcelain, for which the name of the city has become on eponym. However, prior to the 1771 discovery of materials that made the hard-paste porcelain production possible, the region had a long history of producing other pottery objects. The look of Limoges porcelain tends to be lighter and more delicate and typically presents painted motifs on a white ceramic ground. Limoges porcelain plate, c. 1887. One of the main manufacturers of Limoges oyster plates to be familiar with is actually not French, but American: Haviland & Co. Haviland, based in New York, made Limoges easier for the American market to access by streamlining the process and appealing to their tastes—prior to his involvement, most Limoges pieces were produced in the region and then sent to Paris to be painted. Not only was this inefficient, but the Parisians were stubborn about their style. The English style (à la Wedgwood, for example) proved to be more popular among Americans. Haviland opened a school in Limoges to train painters that would be both nearby and flexible to his aesthetic needs. Pair of Haviland Limoges porcelain oyster plates, late 19th century. Haviland Limoges oyster plate from Ruby Lane. Haviland Limoges, ca. 1800s. From Antique Vintage Find on Etsy. Most importantly, as with almost all history, categorization gets messy. Styles mixed and blended, and many vintage finds are unlabeled. The true value of these beauties comes from their hand-craftsmanship, full of individual character, and the joyous luxuries that they celebrate. Dresden manufacturer Richard Klemm, ca. 1900. From Ruby Lane. French Majolica oyster plate from Bordeaux manufacturer Vieillard & Co., 1880. 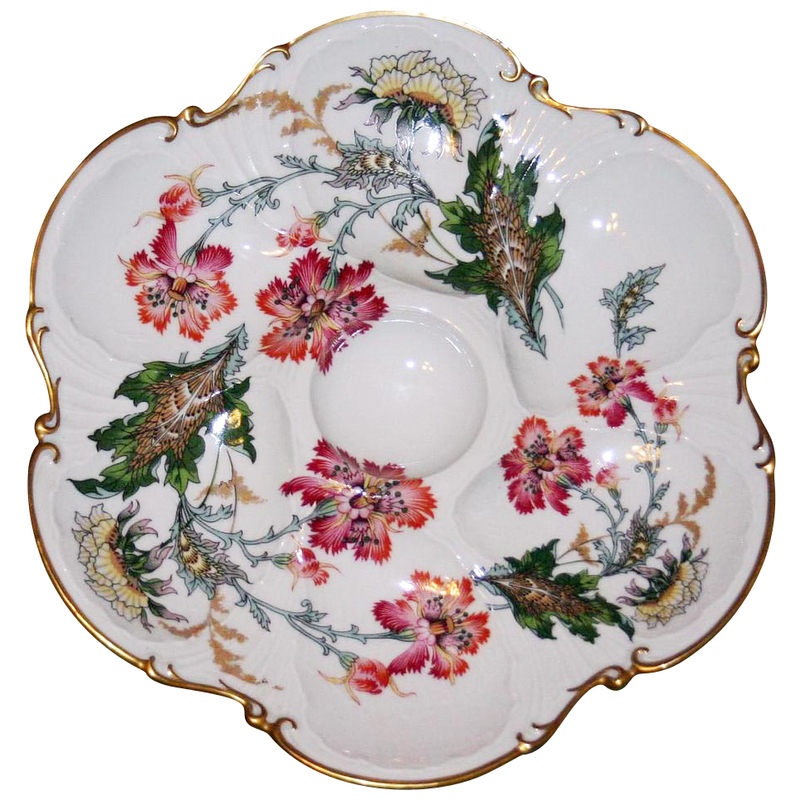 Wedgwood porcelain oyster plate, from Ruby Lane.